Cooking has become a rather therapeutic form of stress relief for me. This was more so after I decided to eat more healthily, so preparing my meals definitely gives me better control over what I’m feeding my body. But as a working mom, it can sometimes be a form of stress especially when it means I have to get up early to prepare for the day’s meal or stay up late into the night to cook and wash up the dishes. Because of that most of my dishes tend to be rather unadventurous, sticking only to my tired and tested methods. Last Saturday, I took part in the “Never too busy to cook”workshop conducted by Daniel who blogs at Daniel Food Diary and and Maureen, otherwise known as Miss Tam Chiak, to pick up some cooking tips and put my excuse of “too busy to cook” at rest. One of the dishes I’ve learnt was the grilled fish fillet with vegetables. It was such a flavorful delight that I decided to try my hand at it. Marinate fillet with pepper, salt and Seasoning A. Leave aside for about 15 minutes. Mix mushroom,carrots, potatoes, capsicum and onion with Seasoning B. Leave aside. Place fillet on grill tray, towards outside. Next place the mushroom mixture towards the inner side of the tray. Sprinkle cheese and paprika on top of fillet and mushroom. Set double grill for 15 min by placing grill tray on top shelf. Sadly, the grill function of my oven failed me, so I had to pop it in my Happy Call Pan for another 10 mins. I reckon, it would have tasted so much better if it had been properly grilled especially when it was topped with cheese. But what I did enjoy about this dish was how simple it was to prepare and how it was a nutritious and colorful one dish meal. For those watching your weight, just hold the cheese and mayo 🙂 Learning simple dishes to cook for my family is one of the things that I’m motivated to learn, because cooking for them is an demonstration of my love for them. I’ve also taken up Daniel’s challenge to take part in his #CookForFamily initiative. It’s a bloggers-for-bloggers initiative where the objective is simply to get more bloggers to start cooking and bonding with their families. Sound great doesn’t it? To be part of this initiative, do drop him an email at DanielFoodDiary.at.gmail.com. 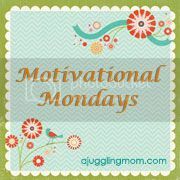 Do link up for my Motivational Monday posts and share a motivational quote, picture or even a goal that you have set for yourself for the week. Grab my badge above and include it in your post after you have linked up. well done Susan 🙂 I really like cooking too but usually only have time during the weekends to do so. Have tonnes of recipes I want to try but no time! Me & Daniel love to cook, its really satisfying to taste the food we prepared ourselves. I do enjoy cooking too. It’s very satisfying to see others enjoying my food. Excellent quote to remember especially on days when I feel like I’m working with not so clever people. Haha. Looks nice! It’s really tedious to cook and look after a kid at the same time, not to mention you even have a full time job. So way to go and keep it up! Definitely a healthy lifestyle! I have to give credit to my trusty HCP for this easy dish. And I like to cook simple easy dishes, like just salads or wraps. I haven’t been cooking as often as I used too. But I hope to get back in the groove when work is less busy 🙂 Look forward to see your dishes too.